Jeanette Mary Huck Schwendeman, 80, of Waterford, Ohio, died Sunday, September 9, 2018 at her home, surrounded by her loving family. She was born on December 24, 1937 in Lowell, Ohio to Herbert and Clara Bauerbach Huck. Jeanette was a 1955 graduate of Lowell High School. She grew up in Lowell until she married Robert, then lived in the Waterford area the rest of her life. Jeanette was a member of Our Lady of Mercy Catholic Church, the Catholic Women's Club, and St. Vincent DePaul, where she was past treasurer. She enjoyed sewing baptismal gowns for newborns at Our Lady of Mercy. She is survived by her husband, Robert Leo Schwendeman, whom she married on September 23, 1958; children, Dianna Rauch (Rod) of Vincent, Ohio, Dan Schwendeman (Brenda), Melvin Schwendeman (Brenda), Cynthia Lang (Darren) all of Waterford, Glen Schwendeman (Darla) of Stockport, Ohio, and Lisa Schwendeman of Waterford; grandchildren, Michelle Heath (Scott), Rose Rauch, Jesse and Alex Lang, Kendrick, Katrina and Dallas Schwendeman; great grandchild, Rylee Heath; siblings, Marian Stalter (Dale), Virgil Huck (Martha), Jerome Huck Lillian Schilling (Charles), Max Huck (Tess), Grace Randolph (Roger), Evelyn Arnold (Kenny), Neil Huck (Joyce), and Kenny Huck (Pat); and many nieces and nephews. She was preceded in death by her parents; and siblings, Robert, Joseph and Bertha Huck. Funeral Liturgy with Mass will be held at 10:00 a.m. on Thursday, September 13, 2018, at Our Lady of Mercy Catholic Church, with The Rev. Timothy Shannon celebrating. Burial will follow in the church cemetery. Visitation will be from 2 to 8 p.m. on Wednesday at the Lowell Chapel of Cawley & Peoples Funeral Home, with a Vigil Service held at 3:00 p.m. Donations may be made to St. Vincent DePaul or to Amedisys Hospice. 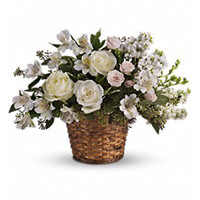 To send flowers to the family of Jeanette Mary Schwendeman (Huck), please visit our Heartfelt Sympathies Store. Lisa Ann I was so sorry to hear of your Mom's passing, I lost my husband in July also. You will always be in my prayers my friend! Lisa Ann, Our deepest sympathy to you and your family at this time of sorry. May you find comfort and peace in your time of need. Hugs, Carroll and Rose. Dear Schwendeman family. I am so sorry to have read of the death of Jeanette. Please accept my sincere condolences. I would like to share something that I have personally found to be comforting. It is found in the Bible at John 5:28, 29 and Revelation 21:4. (Please read) May God give you and your family comfort in His promise that soon we will never experience losing our loved ones in death and we will be able to see them again once they are resurrected. With deepest sympathy and warmth of heart. Sending you our deepest sympathy and praying that the God of all comfort will give you much peace and blessings during this time of sorrow.